From June through August, the temperatures in the Smoky Mountains can easily approach 90 degrees or more in the afternoons. Take a welcome break from the heat and humidity by jumping into our swimming pool to cool off! After a day of hiking through Great Smoky Mountains National Park or exploring Pigeon Forge, you can look forward to returning to Mountain Melodies for an afternoon swim.This is the perfect way to regulate your body temperature while enjoying the beautiful surroundings of the Smokies. After cooling off in the pool, relax in our hotel rooms with private balconies, mini refrigerators and more! If you are a traveling with your family, you won’t have to worry about your kids getting bored while staying at Mountain Melodies! Our swimming pool provides instant entertainment that your children will love throughout their stay at our hotel in Pigeon Forge. Parents appreciate that there is always a great activity available for the kids and enjoy sitting by the pool to watch their children having a blast. Don’t forget to pack your own bathing suit so that you can splash around in the pool with the kids too! We also have a bubbling hot tub where you can kick back and relax while keeping your eyes on your children in the pool. 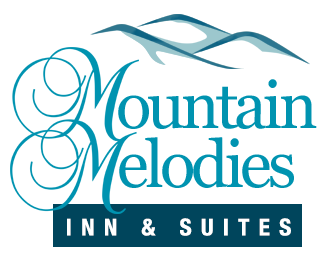 Another benefit of staying at our Pigeon Forge hotel with a pool is the convenient access to fun just steps from your room at Mountain Melodies! After a swimming session in our pool, simply head up to your comfortable hotel room to get a refreshing hot shower. This sure beats using the public shower facilities at a waterpark or community pool! You might even set aside an entire day at our pool area where you can have a picnic and sit outside under the sun to work on your summer tan. Swimming is an excellent aerobic exercise with fantastic health benefits such as reducing blood pressure and increasing the efficiency of your heart and lungs. By taking a few laps or simply playing in our pool with the kids, you are getting a low-impact workout that benefits your cardiovascular, muscular and joint health! As an added bonus, you will sleep even better at night after expending all that energy. Hop into the pool at Mountain Melodies and get healthy! Check out all of our Pigeon Forge hotel rooms to start planning your vacation to the Great Smoky Mountains! We look forward to seeing you by our pool soon at Mountain Melodies!